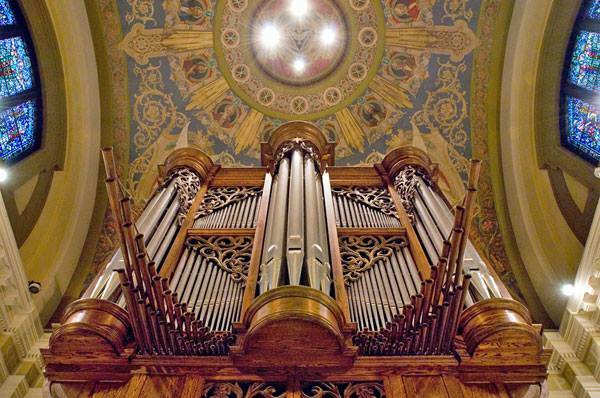 Bass-baritone Marvin Lowe and pianist Roy Jennings will give a concert at St. Paul’s Chapel at Columbia University as part of the Music Summer Series. Concert is free and open to the public. Tuesday, July 31, 2018. 12pm noon. Columbia University, St. Paul’s Chapel, 1160 Amsterdam Avenue, NYC. 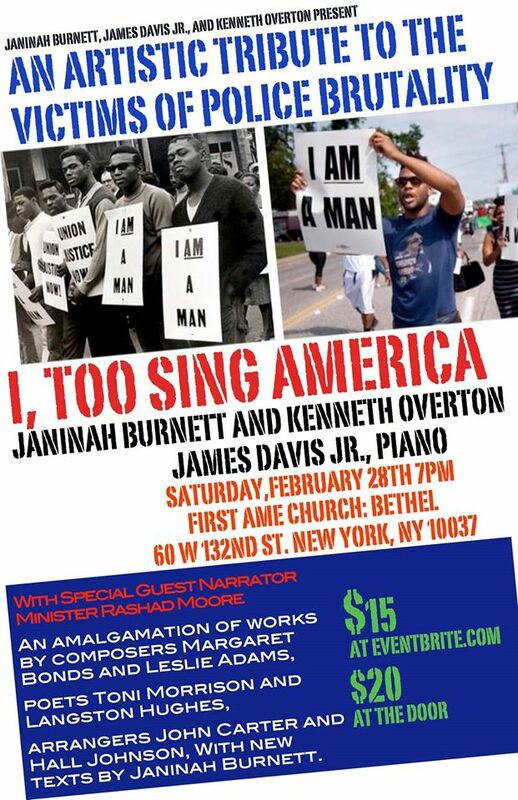 Soprano Janinah Burnett, Minister Rashad Moore, Kenneth Overton and James Davis Jr. present “I Too Sing America. 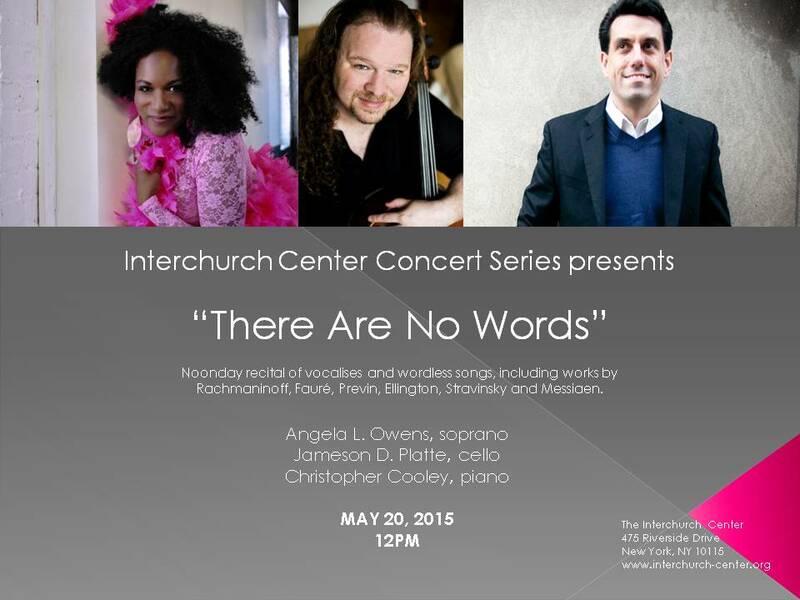 Angela L. Owens in recital at the Interchurch Center May 20, 2015. Lindsay Wagner of the “March 2 Justice” coordinating committee invites you to lend your voice and support to the March 2 Justice Campaign. For more information, visit the campaign’s website listed below. 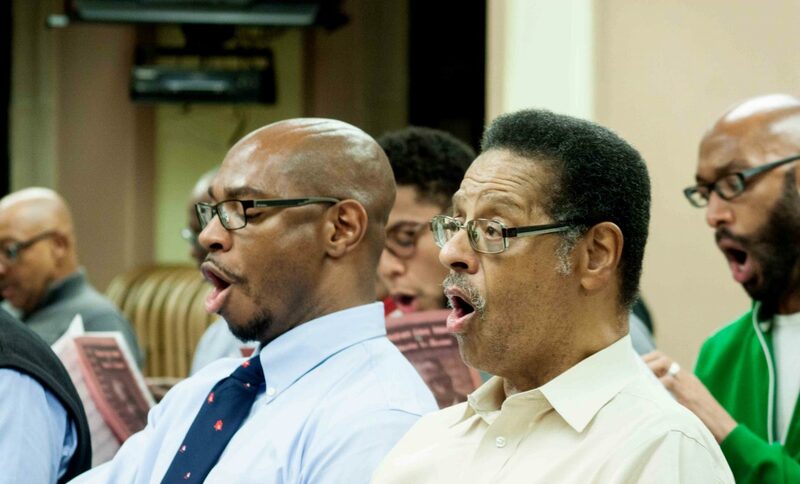 Soprano Candice Hoyes and percussionist Ulysses Owens, Jr. play Minton’s in Harlem! 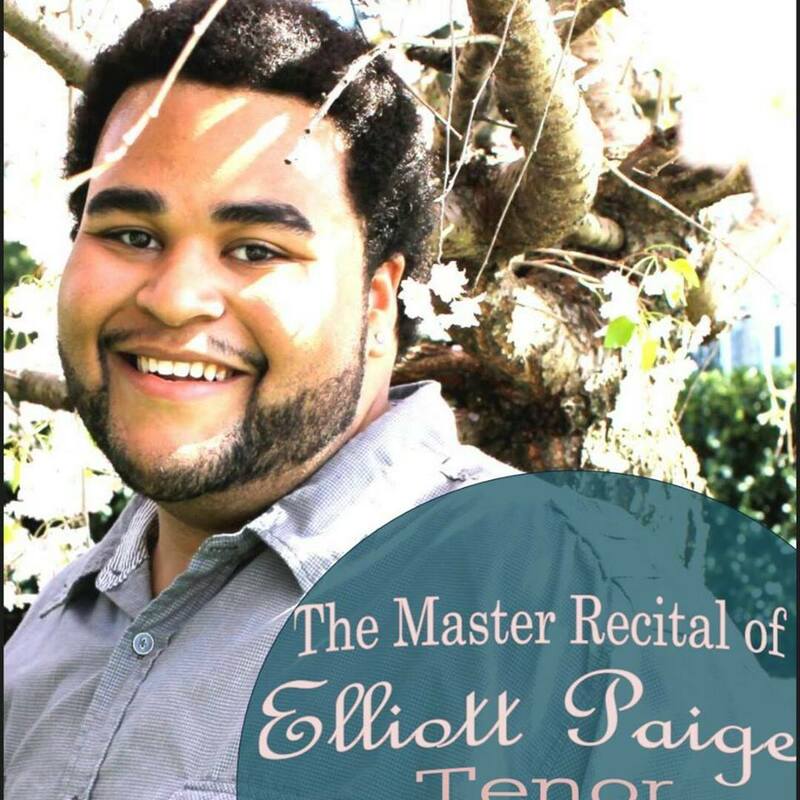 The Master Voice Recital of Elliot Paige takes place Saturday March 21, 2015 at Manhattan School of Music’s Greenfield Hall, 6:30 pm. Admission is free. Angela L. Owens sings in Richard Pearson Thomas’s opera, “Blood of Angels” this Sunday, March 15, 2015. 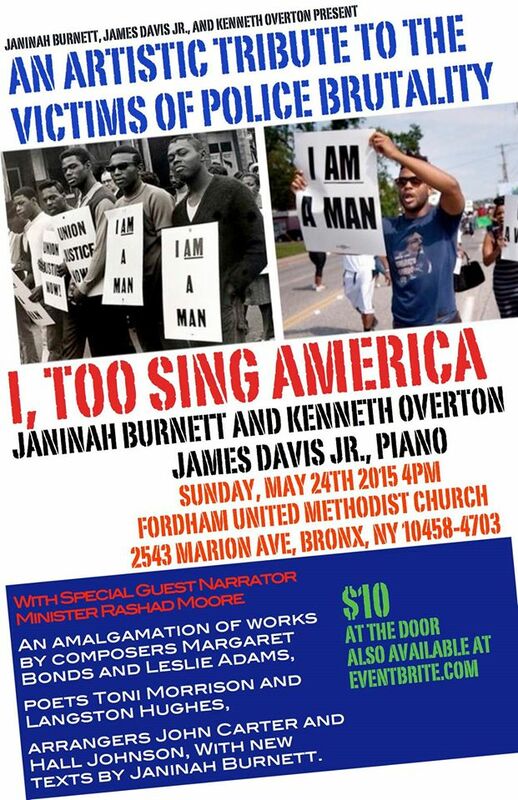 Special Guest, Sharmane Davis, Soprano. Tuesday, February 24, 2015. Free Admission. 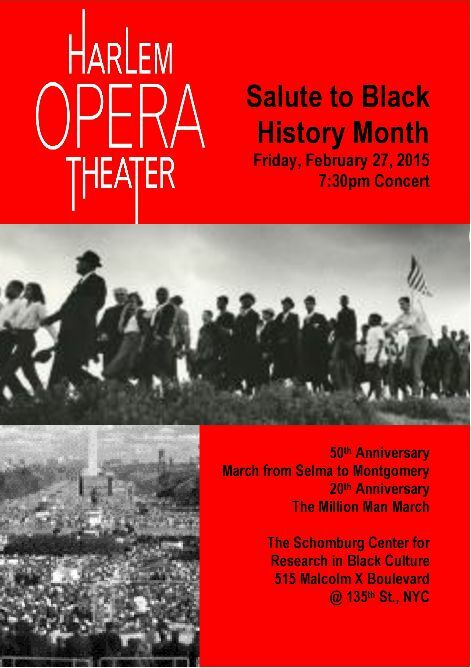 Soprano Lis Stevens sings with Harlem Opera Theater February 27, 2015 for the company’s Black History Month Celebration.